John Michell revealed the existence of a large scale geometric figure across southern Britain and Wales in his book ‘City of revelation’. John Michell demonstrated that the ancient Celtic ‘perpetual choirs’ at Llantwit manor, Glastonbury Abbey and Stonehenge were 'three vertices of a regular decagon of majestic proportions. A fourth vertex exists at Goring-on Thames where a major pagan temple once stood at the junction of several important track ways'. The centre of the decagon is at the apparently insignificant hamlet of Whiteleaved Oak where the former counties of Hereford, Gloucester and Worcester come together. As this figure has been referenced in various books, it is worth investigating its existence and accuracy. The proposed locations of the Decagon. Problems with the Decagon theory. Whiteleaved Oak (Centre) 52˚ 01' 20" 02˚ 21' 03" SO759355 Three County Border. Glastonbury 51˚ 08' 47" 02˚ 42' 54" ST500387 'Sacred Heart' of England. Stonehenge 51˚ 10' 42" 01˚ 49' 29" SU120420 Stonehenge (Astronomy). At present, only three of the proposed sites are substantiated by documentation, the others remain speculative. John Michell, places the three Choirs at Glastonbury, "The choir of Ambrosius" (Stonehenge) and the third at Llantwit Major in South Wales. In 1801, Iolo Morganwg recorded that 'in each of these choirs there were 2,400 saints; that is there were a hundred for every hour of the day and the night in rotation, perpetuating the praise and service of God without rest or intermission.' The function of the choirs was to maintain the enchantment and peace of Britain. However, it must be stated that in all the ancient literature the choirs were referred to as a 'Triad'. The following information was obtained with the aid of 1:50,000 O/S Maps and computer software - 'O/S Map of UK - 4th edition'. Whiteleaved Oak (WLO) - (OS Grid Ref: SO760357) - (Centre of the decagon, Perpetual Choir). 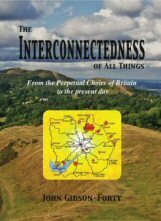 Significance- The village of Whiteleaved Oak sits on the junction of three county borders (Hereford, Gloucester and Worcester). It is situated almost exactly on the 52nd latitude (52˚ 01' 20" N). It is referred to as an 'Ancient Choir' by John Michell. (View Whiteleaved Oak on the 1891-2 O/S Survey Map). Significance - Glastonbury is traditionally known as the sacred 'Heart of England', and it lies on the St. Michael's-ley. It is believed to be the resting place of the Holy-grail, Of King Arthur, and was the place where Joseph of Arimea came and planted his staff. Glastonbury to Centre (WLO). 100.4 Km. Glastonbury to Stonehenge (SH). 60.8 Km. Glastonbury to Llantwit Major (LM). See Llantwit below. 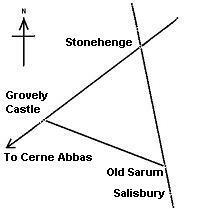 Note: The line from Glastonbury to Stonehenge is also one of the lines of the Right-angled triangle formed when the two are connected to the Avebury/Silbury Hill complex. (View Glastonbury on the 1888 O/S Survey Map). Significance - Stonehenge is known to have been constructed for astronomic purposes. The site has a secondary geometric association with Glastonbury (GL. ), as shown above. Stonehenge to Centre (WLO). 100.5 Km. Stonehenge to Glastonbury (GL). 60.8 Km. Stonehenge to Goring-on-Thames (GoT) 60.5 Km. Note: Both (SH) and (GL) are similar in distance from the centre (WLO), to within 1/1000th part. Therefore creating an almost perfect isosceles triangle. (View Stonehenge on the 1887 O/S Survey Map). The 'Great Decagon' of England. 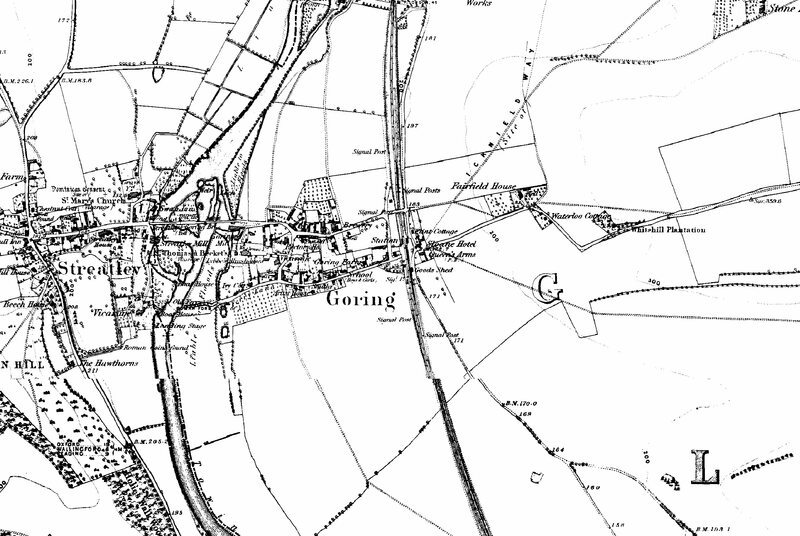 Goring-on-Thames (GoT) - (OS Ref: SU594796) - (Junction of Icknield way and The Ridgeway). Relevance- The next in line after Stonehenge is Goring-on-Thames, which sits at the junction of the 'Icknield Way' and the 'Ridgeway', John Michell talks of a pagan temple at this crossing point of these two important prehistoric tracks. Goring to Centre (WLO). 100.3 Km. Goring to Stonehenge (SH). 60.5 Km. Goring to next proposed loci. See below - Personal research. (View Goring on the 1882 O/S Survey Map). Relevance - This site is also mentioned as an 'ancient Choir' by Michell, associating it with the Celtic tradition of 'choir's', or monasteries, assisting the supporting of the heavens with their perpetual chanting and prayer. The alignment formed by Llantwit Major, White Leaved Oak and Croft Hill follows the path of the sun on the Midsummer Solstice. Llantwit to next proposed loci. Note: Assuming these placements to be deliberate, and considering the level of accuracy obtained for the other sites it is clear that the accurate placement between other locii is not repeated at Llantwit (LM). It seems curious that Llantwit does not show the same level of precision, a point that needs to be examined. (View Llantwit Major on the 1885 O/S Survey Map). Note: While Llantwit Major does not fit have the same geometric precision of the other Locii, the town of St. Mary's Church (SMC) slightly further north of it does. Relevance: Locations dedicated to St. Mary are associated with the St. Michael's ley-line, which is in turn associated with the 'Decagon', however, this location is not mentioned in the Welsh Triads, while nearby Llantwit Major is. This location requires further confirmation. (View St. Mary's Church on the 1885 O/S Survey Map). The first four named named sites (WLO, SH, GL and GoT) are geometrically related within 5 parts in a 1000 which is an extremely high significance ration. All the selected sites have prehistoric remains present however, the relationship between sites appears to be geometric and not physical as there are no routes between locations, and apart from the mention of three in the Welsh Triads, they appear to have no common factor that unites them. The geometry of the decagon shows no preference for a cardinal alignment, instead it is orientated so that its NW and SE faces are orientated along the zenith of the Midsummer solstice sun. Whiteleaved Oak sits (almost exactly) on the 52nd latitude (52˚ 01' 20"). There is a connection between the geometry of the Decagon, and the St. Michael's ley-line. In the case of the 'Decagon' it can be seen that the measurements between nodes are all based on a two dimensional model of the earth (one that doesn't account for the spherical shape of the earth). The only points of the Decagon which can be established with any certainty are Whiteleaved Oak, Stonehenge, Glastonbury and possibly Goring on Thames. 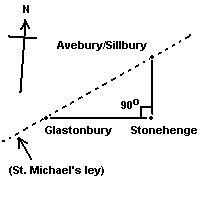 It is therefore interesting to note that Glastonbury and Stonehenge do have a geodetic relationship to each other (when viewed in relation with other important sites such as the Avebury/Silbury complex), which appears to show a separation between several of the most significant British megaliths in units of exact degrees. This particular finding is significant as the length of a degree of latitude and a length of a degree of latitude vary from location to location on the globe. 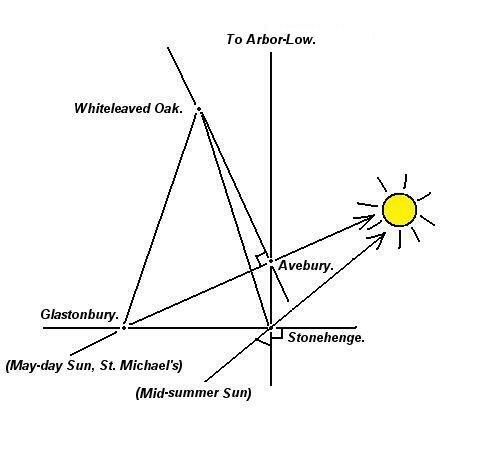 Glastonbury is exactly one degree west of Arbor Low, which is exactly two degrees north of Stonehenge. Avebury is separated from Stonehenge by exactly a quarter of a degree of latitude. 1). A. Service & J. Bradbery. Megaliths and their Mysteries. 1979. Macmillan. 4). Cope, J. The Modern Antiquarian. 1998. HarperCollins Publ.